SNP MSPs for the North-east Gillian Martin MSP and Stewart Stevenson MSP have welcomed additional consideration from the Cabinet Secretary for Health and Sport, Shona Robison on the healthcare challenges facing the North-east. During a meeting with the Cabinet Secretary, the North-east MSPs put forward constituent concerns regarding healthcare provisions in the North-east. Both MSPs raised specific concerns over the dispensary consultation by NHS Grampian and the challenges facing primary care recruitment in the North-east. “My constituents have major concerns about access to dispensary services. In rural areas like ours, people have less access to pharmacies¬ – that’s a major reason why dispensaries are often located in surgeries. I’ve discussed these concerns with the Cabinet Secretary and she has assured me she will raise our concerns with the NHS Grampian Health Board. “The consultation taking place with NHS Grampian on dispensaries relies heavily on evidence. It requires local people to make sure there is a balance view of our community needs- I encourage people to keep making their voices heard. “The Cabinet Secretary has agreed to look at what more organisations like NHS Education for Scotland can do in the way of comprehensive training – at the same time seeing if more can be done to match GPs to the North-east. “This was an opportunity for the Cabinet Secretary to see what we’re dealing with in the North-east. Rural communities are facing different issues – access to dispensaries, primary care provision – these are all vital, people need to be able to see their GP and access medicine. SNP MSP for Banffshire & Buchan Coast, Stewart Stevenson warned that the Tories cannot be allowed to sell out fishing again and vital economic interests in rural communities. Mr Stevenson spoke during a Parliamentary debate where he emphasised the importance of Brexit negotiation strategy. He also stressed that the negotiations on key Scottish rural interests would be best protected by a Scottish Minister taking the lead, while recognising there are both challenges and opportunities posed by Brexit. “I agree with the Scottish Fishermen’s Federation about the opportunities derived from Brexit. Therefore it’s essential we ensure that Westminster isn’t allowed to sell out the fish-catching sector as it did in 1973 when the Tories put us in the Common Fisheries Policy. Tory MP and Secretary of State for Scotland, David Mundell has already said that being entirely in control of our own fishing is not realistic. Negotiations haven’t even begun and the Tories area already trying to sell out Scottish fishing. “In the past year the UK Government has delayed the monkfish swap, given preference to English white-fish trawlers on whiting and Artic cod, top sliced North Sea whiting from Scotland and given an excessive allocation of mackerel to the English inshore fleet. If we are to give Scottish industry confidence, we need someone with a bigger stake in the outcome to lead for us. As a former Minister I have represented the UK position in negotiations and there is nothing to stop the UK Government from allowing a Scottish Minister to lead fisheries negotiations. “While I agree there are opportunities from Brexit for the catching sector, I also agree with NFU Scotland that there are major ‘red lines’ on trade agreements, agricultural support and labour. These issues extend to fish processing – access to labour and to market are critical. The single market is the largest fish market in the world and tends to purchase premium products. These must be taken into account as they will affect processing factories in Fraserburgh, Peterhead and throughout Scotland. SNP MSP for Banffshire & Buchan Coast, Stewart Stevenson called for Parliamentary unity and a diverse approach to support the NHS by ensuring access to recruit EU health professionals and focusing on the benefits of rural living. Mr Stevenson spoke during a Parliamentary debate in which he emphasised the importance of having a multifaceted approach to the NHS and the progress made in the Scottish NHS. He focused on the prominence of migration, preventative care and rural recruitment as key to ensuring the future of a free-at-the-point-of-need health service. “NHS Scotland is outperforming the NHS in the rest of the UK across the board, which is a testament to the Scottish Government’s commitment to a free-at-the-point-of-need health service. While we are performing significantly better than our equivalents down south ­– we remain committed to improving and developing NHS Scotland. “My father was a GP before the NHS was established, at the time he had no ancillary staff and working hours from 7:30am to 9pm. Then when I worked as a nurse in the 60s, there were often only two of us on the ward when there should have been six. Our staff levels are substantially better now than they were then. The NHS has come a long way. “One essential development in the NHS is preventative care. In an environment with greater burden on the health service – prevention must be a priority. It is better for our health and our health service. I myself have benefitted from preventative screenings and consider them a principal element of proactive health care. SNP MSP for Banffshire & Buchan Coast, Stewart Stevenson has commended the efforts of ‘The Food Life’ in Angus on their pursuit of promoting good local food. Mr Stevenson spoke during a Parliamentary debate where he recognised the positive work being done by Angus local food organisation, ‘The Food Life’ Angus. He recognised the importance of local collectives in promoting and delivering the best of Scottish food. “Whether it is Scottish butter perfected on a farm near Peterhead, garlic from Elgin, or the smokie from Angus, there is an incredible list Scottish food. It’s great that local producers are coming together to innovate and promote our fine food and drink. “This activity is has the added benefit of enhancing our ‘Good Food Nation’ policy- to promote good food in all our relationships with food. Good food needs to be a priority because it determines our health both physical and economic. In Scotland we produce the finest food and drink in the world and it’s essential we capitalise on that. “I’m delighted that Angus has stepped up to the mark and can’t wait to see what action this inspires locally with the fantastic producers in the North-east. There are massive opportunities for local organisations to be at the cutting edge of food quality, innovation and promotion. I look forward to tasting more of the amazing flavours of Scotland’s natural bounty”. Tory ministers put personal ambition and political positioning above the interests of the country in their campaign to leave the EU, a former aide to David Cameron has revealed. Sir Craig Oliver, the director of communications to the former Prime Minister, has said that Theresa May avoided backing David Cameron thirteen times in the run-up to the vote as she positioned herself for a future leadership bid. Sir Craig’s book outlines how Boris Johnson flip-flopped on whether to back a Leave vote he expected to lose and confessed that “depression is setting in” at the prospect of backing EU withdrawal. The book also reveals that pro-Leave Michael Gove told George Osborne that Brexit would cause “scarring and burning” to the economy. “These revelations prove what we already suspected – that the Brexit campaign was an exercise in breath-taking recklessness. Its main protagonists were more concerned with their personal ambitions and cabinet rivalries than about the interests of people, business and the country. 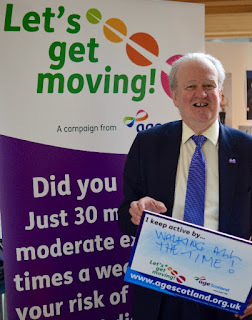 SNP MSP for Banffshire & Buchan Coast, Stewart Stevenson has backed Eye Health Week and its role in promoting eye health. Mr Stevenson spoke during a Parliamentary debate calling for the recognition of campaigns like Eye Health Week. Stevenson called for the recognition of the good work of those in the sector and for the continuing need to promote eye health as a vital part of overall health. “Eye Health Week is a great opportunity for us. It’s a chance for us to promote the great work across the sector- the work of eye care charities, organisations and health professionals. It’s important for us to recognise the constructive contribution they make to Scotland’s health. “At the same time there is room for us to increase awareness. There are still significant numbers of people that don’t know eye examinations are free in Scotland. The Scottish Government put free exams in place to benefit the health of everyone in Scotland. It’s essential that we raise awareness and get people to take advantage of it. “Having learned lessons from the 2015 round of CAP payments, the Scottish Government is determined to provide as much certainty as possible – not just for farmers and crofters, but for the wider economy in rural communities like the North-east. SNP MSP for Banffshire & Buchan Coast, Stewart Stevenson has warned Scotland’s progress on climate change is at risk of being rolled back by a Tory Brexit. His warning comes as Scotland marks its national Climate Week, which runs from 16th September until 23rd September. The opposing approaches of the Scottish and UK governments in the last week were highlighted by Stewart Stevenson – as a Scottish Government supported world-leading tidal energy project was unveiled days before the Tories approved the costly white elephant Hinkley Point. A Climate Change Committee report also showed that Scotland is leading the UK in cutting carbon emissions, despite Tory cuts to renewables damaging the industry. This has led to SNP MSP Stewart Stevenson to calling on the Tories to match the Scottish Government’s pledge to maintain vital environmental protection measures required under EU law after Brexit – something that is important in safeguarding communities across North-east from the effects of climate change. “The Tory government at Westminster are in serious danger of damaging our efforts to tackle climate change and build a sustainable future for the North-east– which is completely unacceptable and light-years away from our efforts in Scotland, marked by the annual national Climate Week. “Time and again, the Tories have failed to adapt to the need to develop a more sustainable energy policy that would benefit our local communities in the North-east. From the appointment of Andrea Leadsom, who once asked if climate change was real, to the environment portfolio and harrowing cuts to renewable subsidies, to a willingness to spend billions on nuclear power whilst scraping innovative Carbon Capture and Storage schemes, we can see that their priorities lie elsewhere. “As a former Minister for the Environment and Climate Change I fought long and hard for the environment and for the economic opportunities that would emerge with new sustainable technology. The Tories on the other hand leave much to be desired on the environment – and with Brexit now looming over the North-east, I don’t have high hopes for the vital protections that the EU provides on animal habitats, air and water pollution and carbon emissions being maintained. SNP MSP for Banffshire & Buchan Coast, Stewart Stevenson, has called for the maintaining membership of the EU single market after Brexit and spoken about its importance to the Scottish economy. 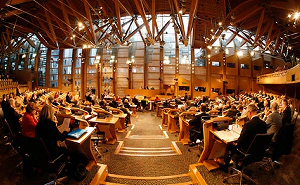 Mr Stevenson spoke in a Parliamentary debate on responding to the EU Referendum and Scotland’s economy. Stevenson called for maintaining Scotland’s membership to the EU single market in order to protect the vital trading opportunities and access to talent it offers. “The EU single market plays a vital role across several sectors both in the Scottish economy and the UK economy as a whole. A recent report by Aberdeenshire Council has shown that Brexit could cost the Council £11m - including £1,437,000 allocated to North East Scotland Fisheries Local Action Group. North-east farming alone receives between £75m and £100m a year in subsidies. “There is also potential harm to technological firms. With the implementation of the Unitary Patents Court a UK outside of the single market would very likely have to file court actions across 38 countries. Alternatively, those within will only have to file one. This is just one of many costs which leaving the single market will give us. These additional costs to doing business and exporting products will unequivocally make Scotland less competitive. Banffshire & Buchan Coast MSP Stewart Stevenson is urging 16 and 17 year-olds to ensure they are registered to vote. Sixteen and seventeen-year-olds are now eligible to vote in Scottish elections, including the local government elections taking place on 4 May 2017. “Engagement by young people in the political process has been extremely high since the Scottish Government changed the law to allow 16 and 17 year olds to vote in the 2014 Independence Referendum and the 2016 Scottish Parliament elections. “Indeed, there was quite a bit of disappointment in 2015 when many young people who had cast their first vote in 2014 found they were unable to vote in the UK General Election just a few months later because Westminster refused to follow Scotland’s lead. “However, I’m delighted that – for the first time – 16 and 17 year-olds will be able to cast their votes in the Council elections on 4 May, but it’s important that they ensure they are on the Electoral Register. The annual canvass for the Register is taking place now and is seeking details of Aberdeenshire residents who will be 15 on or before 30 November 2016, to make sure they get registered and are therefore ready to vote as soon as they turn 16. Local MSP Stewart Stevenson has welcomed a new poll by Ipsos Mori which has shown support for independence virtually tied with support for the union, with 48% of likely voters backing a Yes vote in the event of a second referendum. The poll also found that of those who changed their mind on independence following the Brexit vote, a majority moved from No to Yes, with the overall result within the statistical polling margin of error. “This poll shows a virtual dead heat, and is the latest to demonstrate that many No voters are reconsidering their views on independence. “The UK that Scotland voted to remain part of in 2014 will soon no longer exist. The complete lack of planning by the UK Government for the EU referendum outcome has created tremendous uncertainty for business, for investors, for EU citizens living in the UK and for our public services and there are growing concerns over the plans of an increasingly right-wing Tory UK government. Stewart Stevenson MSP is getting behind the roll-out of high-speed broadband in his Banffshire & Buchan Coast constituency – where fibre is now available in places like Banff, Macduff, Portsoy and Aberchirder thanks to the Digital Scotland Superfast Broadband programme. Thousands of households and businesses in the Banffshire & Buchan Coast constituency can now access high-speed fibre services through the £410 million Digital Scotland roll-out, with more premises in the region set to benefit in coming weeks and months. Across Scotland, more than 640,000 premises are now able to connect to fibre-based services through the Digital Scotland project, led by the Scottish Government and Highlands and Islands Enterprise in their area and delivered on the ground by Openreach, BT’s local network business. Other partners in the project include the UK Government through Broadband Delivery UK (BDUK), Aberdeenshire Council and the European Regional Development Fund. Stewart Stevenson MSP is urging local people to consider the benefits of a high-speed fibre broadband connection, which can be ordered through their chosen service provider, as upgrades are not automatic. The MSP visited a local fibre cabinet on Seafield Street in Banff to explore the engineering behind the technology. “Fibre broadband has an essential role to play in everyone’s lives – whether at home or in business. It’s great news that thousands of local people across Banffshire and Buchan Coast can now connect to this exciting technology if they choose. The Digital Scotland Superfast Broadband programme will deliver access to fibre broadband to around 95% of premises by the end of March 2018, when combined with existing commercial roll-out plans. It underpins the Scottish Government’s aim for Scotland to become a world class digital nation by 2020. BT is investing £126m in the partnership on top of its commercial investments in Scotland. “Across the Openreach network, more than two million Scottish premises can now connect to high-speed fibre broadband and, on average, about one in four households have made the move to the faster speeds now available. “Driving strong take-up is especially important in areas covered by the Digital Scotland programme, as high adoption rates will trigger the release of further funds for investment into the network. We very much welcome Stewart Stevenson MSP’s efforts to highlight the many benefits this technology offers to his constituents. “More and more areas of Banffshire and Buchan Coast are now live thanks to the programme. It’s important that people realise that in order to take advantage of the benefits that fibre brings, you need to sign up with a service provider. Fibre broadband offers fast and reliable connections at speeds of up to 80Mbps and there are many suppliers in the marketplace to choose from. Further information about the Digital Scotland Superfast Broadband project can be found at www.scotlandsuperfast.com and more details on BT’s commercial roll-out are at www.superfast-openreach.co.uk. SNP MSP for Banffshire & Buchan Coast, Stewart Stevenson, has called on the Conservative UK Government to let Scotland lead on fisheries negotiations and allow significant local input. Mr Stevenson spoke in a Parliamentary debate on the implications of the EU Referendum result and the UK negotiating position. Stevenson stressed the importance of access to the EU single market and free movement of people for the fishing sector. “Westminster is woefully out of touch with the needs of Scottish fishing. The Conservatives claim to have the economic interest of Scotland at heart, but that just isn't true. If that was true, they wouldn't be attempting to take us out of the EU single market or the free movement of people. Both are essential to maintaining our exports and their actions are a damning indictment of their economic policies. "The Common Fisheries Policy has never been good for us. I agree with the Scottish Fisherman's Federation that we need fairer shares of catching opportunities within our own waters. I also recognise that it is incredibly frustrating to our own fishermen that we can suspend fishing in an area of our own interest, but other nations' boats can continue to fish in those areas. "The Conservatives put Scottish fishing into the CFP , therefore I highly doubt their ability or sincerity in protecting the interest of Scottish fishing. The Scottish Government and the local fishing communities have the expertise, knowledge and motivation to get the best deal for our fishing sector. If there is a genuine desire to do that- then hand it over. We're ready and so is the industry." Banffshire & Buchan Coast MSP Stewart Stevenson welcomed new Climate Change Bill which will target 50% emissions reduction by 2020. Today the Scottish Government announced its program for the next year. Included among planned legislation are a Housing Bill and a Warm Homes Bill which will be of considerable interest to people in the North East of Scotland. With the achievement the 42% reduction in emissions to which the 2009 Climate Change (Scotland) Act having been achieved four years early, the Government also plans a new Climate Change Bill which will set a new target of 50% for 2020. “Scotland's targets for tackling climate change have been among the most ambitious in the world. When I took the previous Bill through Parliament the 42% reduction target for 2020 was regarded as very challenging. But we have beaten that. “The new target of 50% is necessary to keep up the pressure. And as a world leader in tackling climate change there are also clear business opportunities to turn our skills and experience into to new high value jobs. “I look forward to seeing the detail of the new Bill and will work constructively to make it the best Bill we can”.